Introduction: The audience meets Alex, a ten year old playwright with the power to change the world around him. When Alex doesn’t like the way he and his classmates are acting, he writes a story for them to act out that teaches them all an important lesson. Scene 1: Alex and his classmates don’t do their homework, goof off when the teacher isn’t around, and don’t take responsibility for their actions, so Alex writes a story about a Queen and her three children to teach his classmates and the audience about responsibility. When the Queen leaves for a long journey, she gives each child a grain of rice to care for. When she returns, her two oldest children, who have been distracted by other things, make excuses for why they have done nothing with their rice. Her youngest child has planted the rice, though, and is rewarded by being placed in charge of the kingdom. Alex and his classmates learn to make their schoolwork a priority, help each other out, and take responsibility for the mistakes they make. Scene 2: Alex and his classmates argue about who gets to use the space on the playground at recess. They take each other’s equipment so that no one can play and nobody ends up happy, so Alex writes a story about two farmers and their wives to teach his classmates and the audience about compromise. The farmers are always competing and when a stranger shows up to grant them each a wish, they each want to wish for the other farmer to fail. Their wives wish for the other to succeed, though, and everyone ends up happy. Alex and his classmates learn that there doesn’t always have to be a winner and a loser. Instead of fighting over what to do, they compromise, take turns, and all play together. Scene 3: Alex is trying to collect donations for a Relief Fund but none of his classmates are interested in giving, so Alex writes a story about a town full of selfish people to teach his classmates and the audience about teamwork. The Mayor of the town announces that there will be a feast and everyone will bring a jar of stew to put in a giant pot to share. No one wants to give up their own food, though, so everyone just brings a jar of watery gravy to add to the pot. Alex and his classmates learn that great things can happen if you work as a team, but nobody really wins if you don’t. Not only are they all willing to give to the Relief Fund, but they are all excited at the thought of how much they can accomplish if they work together. 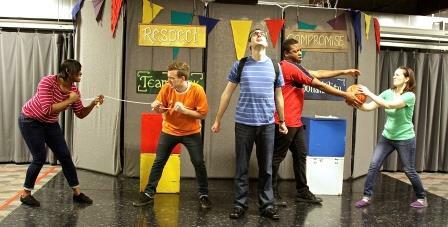 Scene 4: Alex’s classmates bully another student and Alex isn’t sure how to help so he just stands by and watches. He feels bad about it, though, so he writes a story about King Arthur and an old hag to teach his classmates and the audience how important it is to respect everyone. When the Black Knight challenges King Arthur to a duel and wins, he agrees to spare Arthur’s life only if he can answer a riddle. The old hag is the only one who can solve it and Arthur promises to grant her one request out of gratitude. She asks for the most valuable thing that he could ever give her: respect. Alex and his classmates learn how important it is to respect everyone, even if you think they are different. Alex stands up for the target of the bullies and encourages her to tell an adult what is happening. The bullies realize that they wouldn’t want to be treated that way and apologize. Conclusion: Alex tells the audience that they all have the power to change the world around them, too. He and his classmates encourage the audience to apply the lessons taught by the stories by being responsible, compromising, working as a team, and always respecting everyone.